Nicknamed the American Riviera, Santa Barbara is nestled along California’s Central Coast and is, first and foremost, a wine town. 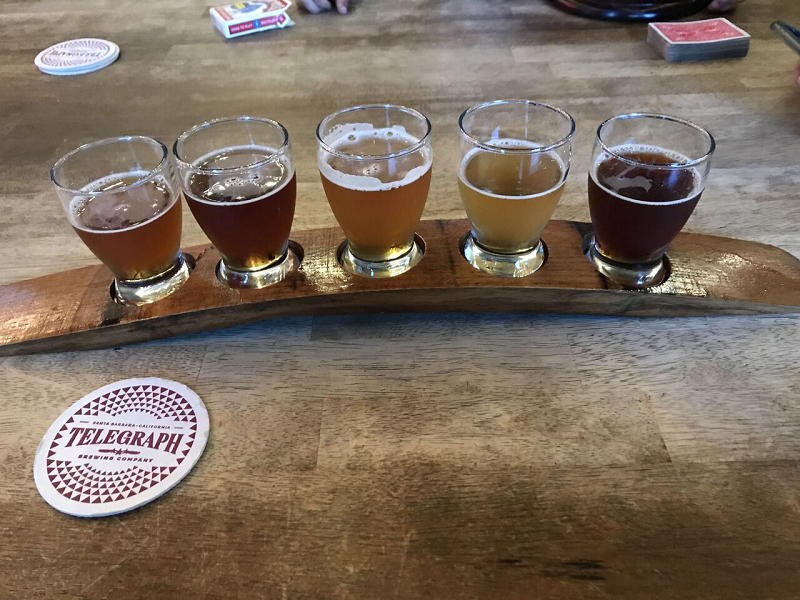 When Brian Thompson launched Telegraph Brewing Co. (418 N. Salsipuedes St.) in 2006, it became the quiet city’s first packaging brewery and has consistently brewed delicate, Belgian-leaning ales ever since. This isn’t to say Telegraph’s British and American styles (nearly every Belgian-inspired brewery keeps the lights on with its IPAs) display any less finesse. Although Telegraph’s beers are available throughout California and a few other states, last December it made a minor splash among beer industry followers when Utah’s Epic Brewing purchased the relatively small brewing company. While Epic’s plans assuredly include expanding the IPA offerings, Telegraph’s coup de foudre is its bounty of foudre and wine-barrel-aged beers. Because again, this is wine country. Why is a distinctly Belgian-yeast-forward beer with telltale esters and spiciness called a California ale? It’s made with entirely local ingredients in the vein of post Gold Rush era Cali. Medium-bodied with a gossamer finish, this beer’s been easy to dive into for a decade. Abetted by Trappist ale yeast that brings cohesiveness and complexity to the layers of malt, those notes still play undercurrent to the vibrant flavor of cold-brewed coffee courtesy Santa Barbara’s Handlebar Coffee, with a muddy bite that rounds out this concoction. It’s only made better when the truck outside is dishing out tacos al pastor. Not reddish like a crystal-malt-imbued Northwest IPA. Not hazy or sweet like a New England IPA. Just a classic citrus bomb in the manner of the California IPAs that put the style on the map. The lemongrass and orange zest flavors burst out of the Cascade, Centennial, CTZ and Meridian hops, pairing perfectly with the vistas of citrus groves south of Santa Barbara. This ultimate fireworks display of terroir sees a barrel-aged, bright, blonde sour ale refermented with grenache blanc grapes (from nearby Simple Fish Wines). The result, belying its alcohol content, is surprisingly refreshing for near year-round beach weather and the lemony-apricot nectar that flows from this glass would convert oenophiles into beer lovers (and vice versa). This palette for one’s palate would be deemed the Red Period. In the vein of a Flanders red, this deep, rich sour ale is aged in Foxen Vineyards pinot noir barrels and conveys lush berries (raspberry and boysenberry) with a tinge of pomegranate sweetness to counterbalance the tannins.